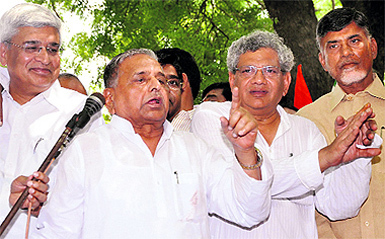 With his support to the UPA, all eyes are on Mulayam, who has his cards close to the chest. He dreams of a third front. Will the former wrestler ever make it to the top post of Prime Minister? At the moment, the dhartiputra of Uttar Pradesh, Netaji Mulayam Singh Yadav is the Gama Pehalwan watching the dangal of Indian politics. The power elite across the political spectrum of the country are trying to guess the next daav-pench of this seasoned wrestler in the dirt-pit of national politics. REACHING OUT: Mulayam with CPM leaders Prakash Karat and Sitaram Yechury, and TDP president Chandrababu Naidu during a protest against FDI earlier this month. Why no pehalwan from Punjab? Punjab wrestlers who brought glory to the state once are now struggling. If the state has to revive the sport, it must make an urgent shift from mud akharas to mats. Competitions in the mud, low levels of professionalism and changing rules of wrestling in Punjab have rendered wrestling less popular. At one time, it was the second-most popular sport after kabaddi in the state and used to dominate not only the national scene, but also Asian and Commonwealth competitions. The interest of people has only waned since. Even his senior ministers and former ministerial colleagues in UP are not sure what would be the next move of the party patriarch. This time they do not even have a maverick character like Amar Singh to blame for putting together a strange combination of friends and fellow travellers, which the Samajwadi Party had once assembled and depended upon — an Ambani here, a Harkishan Singh Surjeet there; an odd Jayaprada or Jaya Bachchan to raise the glamour quotient. turnabout on the tie-up with Kalyan Singh. Mulayam is proving that pragmatism is indeed his middle name. Either he has learnt networking lessons well or the new-found confidence of a landslide majority in UP has given him the coolness to run with the hare and hunt with the hounds. One day he is on the streets leading a Bharat bandh to protest the FDI and hike in prices of diesel and LPG along with CPM’s Prakash Karat and Sitaram Yechury; and a day later, with equal ease, he meets Sukhbir Badal, leader of the SAD (BJP alliance partner), to explore the possibility of working towards a third front. Amid speculation among the UPA-II constituents, the parliamentary board of Mulayam’s party, along with 22 MPs, decided to continue supporting the UPA from outside to keep the communal forces at bay. But with equal conviction, the veteran of the political akhara continues to keep the UPA on its toes as he announces to support a resolution against the FDI if Mamta’s TMC pushes for it. It is not a secret that Mulayam’s blowing hot and cold is largely due to the political exigencies of UP where he has to remain two steps ahead of his beta noir, BSP supremo Mayawati. Add to this his prime ministerial ambition. The opportunity that the 2014 Lok Sabha elections present to him to push a third front government is too appealing to him to ignore. He is the only leader among all non-Congress, non-BJP leaders of prominence whose party is ruling a state at the moment. To tip the scale, Mulayam would need to graduate from being perceived as a regional leader to a decisive national leader. Despite an unprecedented mandate in UP and 22 MPs in the Lok Sabha, his Samajwadi Party is technically a regional party, deriving strength only from one state and is not pan-India like the BSP. At the same time, the fact that behenji is breathing down his neck is something he can forget only at his own peril. The SP won 224 seats (56 per cent of seats) in the historic victory claiming 29 per cent of the vote share. But what makes the success less sweet is the fact that though Mayawati managed only 80 seats (20 per cent of seats), the BSP was barely 3 per cent behind the SP in terms of the votes. Mulayam knows that the BSP is not down and out. If 29 per cent of the state’s electorate rode the “cycle” bringing his party to power early this year, behenji’s “elephant” is not far behind with 26 per cent of the electorate solidly behind it. A few wrong moves has the potential to quickly melt the thin vote share advantage which would make a world of difference to the fortunes of the SP under the skewed ‘first past the post’ electoral system. The raison d’etre of his every move at the moment is part of a strategy, which includes retaining command in UP by not giving Mayawati a chance to score points that may upset the delicate balance at home and hamper his attempt to emerge as a national leader. On the home turf, if son Akhilesh’s government does not project him as a pro-growth leader, the anti-incumbency factor would set in, giving Mayawati the edge to swing the pendulum. This explains Mulayam’s recent meeting with party ministers and cadres, where he threatened to show them the door if they did not deliver. He is also pushing his son’s government to speedily implement the party’s populist manifesto. But Akhilesh’s performance is no guarantee as there are many examples of the electorate voting for regional parties in the Assembly elections and national parties during the Lok Sabha polls. That leaves Mulayam with the choice of maintaining, if not improving, his MP tally. The final decision would rest on his proven skill in bringing diverse people and opinions together for a cause (read non-Congress, non-BJP coalition at the Centre). His plus point is his ability to keep a dialogue open as well as exercising the option of agreeing to disagree. Such principles of a healthy functional democracy are prerequisites of a successful coalition, but are easier articulated than achieved. One less acknowledged factor to understand the hurry of 73-year old Mulayam not to miss the 2014 bus is the state of his health. Rumours of his failing health have been doing the rounds for months. While no one close to him is ready to say anything about the nature of his illness, it is visible that he is not in the pink of health and is reportedly on steroids. Compared to an agile Dr Manmohan Singh at 80 or LK Advani at 84, Mulayam is unable to keep pace with his gruelling schedule. His resolve that Akhilesh take up the CM’s post, despite opposition from several Cabinet colleagues, was his way of establishing a clear line of succession in the party. However, there are many hurdles that he must negotiate in the coming months. The recent incidents of communal violence across UP show a government that wants to be perceived as pro-Muslim in poor light. The Intelligence Bureau has reportedly briefed the Centre on the volatile situation in the state. His party’s vehement opposition to the proposal to bring in a Bill for reservation in promotion for SC/ST candidates cannot guarantee him the support of these communities, which are known to have sided with him during the recent elections. The failure of all non-Congress, non-BJP governments at the Centre to complete their full term in office does not appeal to a young nation, which is looking forward to growth rather than a government squabbling to remain afloat. To emerge as a consensual prime ministerial candidate, he must prove that his party has a positive, not populist, agenda for growth in UP. Just as his party has managed to rid itself of its anti-English, anti-technology image, it has to now work towards altering its anti-women reservation stand. It has to project an inclusive administration ensuring security and empowering the minorities and women. The days to come would prove how successful the one-time wrestler would be in emerging as the Rustam-e-Hind in the akhara of India’s coalition politics. “If Haryana has surpassed Punjab and started producing Olympic medallists, it is because of its timely switch from muddy akharas to standardised wrestling on mats,” says former Asian Games bronze medallist Sukhchain Singh Cheema, who runs a training centre in Patiala. His son, Palwinder Singh Cheema, was the last recognised wrestler from Punjab to win international laurels. Traditionally, Punjab has been a land of wrestlers, most of them topnotch stars. Rustam-e-Zaman Dara Singh, Rustam-e-Hind Tiger Joginder Singh, Tiger Jeet Singh (World Wrestling Federation fame), Rustum-e-Hind Mehardin, among several others fought in mud akharas and were distinguished winners of the battle of Flag of Honour (Jhandi Walli Kushti). None of them participated in competitions held under international wrestling rules. Among those who took to mat wrestling and represented India included Sukhchain Singh Cheema, Kartar Singh, Jagdish Bholu, Palwinder Cheema and Budh Singh. Those recruited in the Punjab Police on the basis of wrestling skills are Shamsher Singh, Sarwar, Mukesh, Raj Kumar and Rajinder Singh — all from Haryana. Most of these regular wrestlers represented India in international competitions. But for the past some years, Punjab is not being unrepresented in national teams. Kartar Singh, president of the Punjab Wrestling Association, and Palwinder Singh Cheema, now a Deputy Superintendent of Police, are perhaps the last big names in standardised wrestling to represent Punjab in national squads. Officially, Punjab has 14 coaching centres, besides two run by the Sports Authority of India (SAI) to hone the skills of young grapplers. In addition to these, there are about 300 akharas in rural Punjab where budding wrestlers are groomed, not according to rules governing the sport, but to entertain huge crowds at rural sports festivals and chhinjs (wrestling meets) carrying huge cash prizes. While competitions held on mats and in accordance with the rules of the International Wrestling Federation are few, those held in rural Punjab in mud akharas run in hundreds. And still Punjab finds no mention in national teams. Wrestling as a sport is losing appeal among college and university students. Malwa College, Bondli (Samrala), used to dominate Panjab University Inter-College Championship, but does not even have a team any more. International star Budh Singh was a product of this college. He now runs an akhara in Khanna. It was the death of Avtar Singh, wrestling coach of Malwa College, which ended the supremacy it once enjoyed in wrestling. A promising wrestler, Gaurav, of nearby Machhiwara continues to hold the flag hoisted by his father Shammi, now a councillor, as a member of the Panjab University champion (Malwa College team) in 1993-94. VS Kundu, a coach of the SAI who runs a centre at Zirakpur, maintains that those groomed in rural mud akharas are primarily for rural sports festivals, where the major allurement is money. “There are no rules in these meets. Sometimes, bouts continue endlessly and terminate in a draw. The minimum duration is 15 minutes and can continue even beyond an hour. These are more to entertain the audience than exhibit wrestling skills of participants who hardly get any time to train and improve their grappling abilities,” says Kundu. He now has 30 promising wrestlers training on mats under his watchful eyes. Most of the coaches, former wrestlers and sports administrators want the khalifas, those controlling mud akharas, to be disciplined and brought under the purview of the Punjab Wrestling Association. “There has to be some coordination between mud akharas and regular coaching centres for results in major competitions like the Asian Games, Commonwealth Games and the Olympics,” says Sukhvir Grewal, chief organiser of the Kila Raipur Rural Olympics, admitting those running “mud akharas rule the roost”. “They decide the prize money for each wrestler who participates in any of the 200-odd rural sports festivals in the state. Bouts are invariably inconclusive. The low-level of professionalism is doing more harm than good to the sport,” he says. The major mud akharas are in Amritsar, Taran Tarn, Phagwara, Alamgir, Machhiwara, Khanna, Patiala, Hakimpur and Mannawala. Wrestlers hold the state government responsible for the plight of the sport. A coaching centre run by the Punjab Sports Department at Sur Singh (village of famous wrestler Kartar Singh) has placed mats in a shabbily maintained indoor hall. It has a mud akhara to train young wrestlers, some of who come from families of grapplers of yesteryear. The centre has a gymnasium and only eight of the 70-odd trainees get refreshments. Similar centres have come up at Bajpur, Taran Tarn and Patti in the border belt. A centre for women wrestlers at Taran Tarn is functioning under the supervision of former international wrestler Suman. She has 30-odd wrestlers, some of who have won medals in junior nationals. Coach Balbir Singh says that change in rules of reducing the wrestling time from 15 minutes to nine minutes, and now to four minutes, has taken a toll on Punjab wrestlers who are slow to warm up. He says some prominent wrestlers of yesteryear had won decisive points in the sixth, seven, eighth and ninth minute of their bouts. But now it is the best of three rounds, with each round of two minutes. “Wrestling competitions in the Olympics and other international events is now just a one-day affair. So, all the bouts from round one to the gold medal stage have to be completed the same day. Fans of wrestling in Punjab, however, are “addicted” to watching bouts that continue for 30 to 40 minutes and still end in a deadlock,” says Balbir Singh. “Unless we bring our young wrestlers to the mat, we cannot regain our supremacy in wrestling. We are now using the services of a Russian coach to train our select wrestlers at the PAP Complex in Jalandhar. We hope to have a strong representation in the 2016 Olympics,” says Sohan Singh, secretary of the Punjab Wrestling Association.